This pungent superfood is a powerful flu fighter. Garlic contains compounds called allion and allicin, which have direct antiviral effects, saysBryan Rade, a naturopathic doctor based in Halifax. 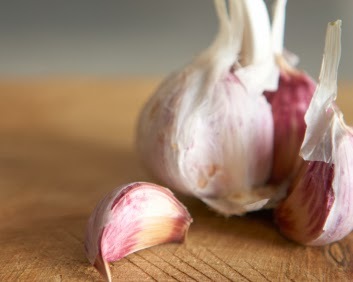 “If you happen to come in contact with a flu virus, [garlic] can help destroy it before it becomes a full-blown flu in the body.”To get the most out of garlic’s flu-fighting properties, it’s best to chew a raw clove every three or four hours. If you can’t bear the taste, try cutting cloves into pieces and swallowing ( telan ) them down like pills. Rade suggests mixing crushed garlic with honey, which is also reputed to have antiviral properties. Still not in love with idea of eating raw garlic? Add a few extra cloves to a soup or stir-fry. “Even if [garlic] is cooked, [it] still has sulfur-containing compounds, which have anti-microbial activity as well,” says Rade. Like garlic, onions also contain the antimicrobial compounds allion and allicin. 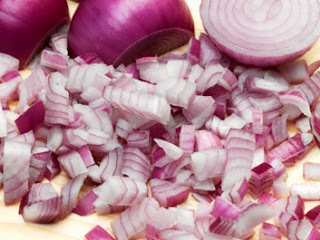 To get this superfood’s full flu-fighting action, Rade recommends consuming a serving of raw onions every few hours. If that seems unpalatable, add extra servings to your meals, like in a French Onion Soup. “Trying to put it into your food is much better, in my opinion, because then it’s part of your lifestyle,” says Rade. Spices such as turmeric, cloves and cinnamon are packed with antioxidants, which help improve the function of the immune system. Rade suggests consuming a teaspoon of spices every day to help ward off the flu. Try mixing some cinnamon into your morning oatmeal or sprinkling extra nutmeg over a bowl of applesauce. 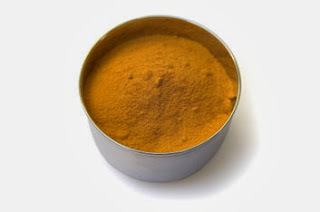 If you’re already feeling ill, traditional Indian medicine (called Ayurveda) recommends using spices to help sweat out a fever: Sip a tea from a mixture of boiling water, 1/2 teaspoon (2.5 mL) each of cinnamon and coriander and 1/4 teaspoon (1 mL) of powdered ginger to help bring your temperature down. 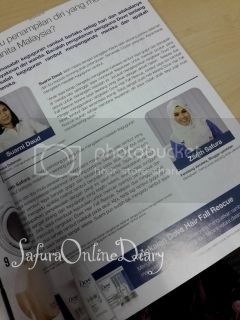 ( Menghirup teh dari campuran air panas, 1/2 sudu teh (2.5 mL) setiap kayu manis dan ketumbar dan 1/4 sudu teh (1 mL) halia serbuk untuk membantu anda menurun kan suhu badan ) - aku tolong translate kan ye! All berries have high concentrations of antioxidants to help fight off flu viruses, says Rade, but blueberries pack the most punch: When tested against other foods, blueberries were found to have more antioxidants than 40 other fruits and vegetables. Rade recommends eating at least one serving (1/2 cup or 125 mL) of raw berries every day to help you stay healthy during the flu season. 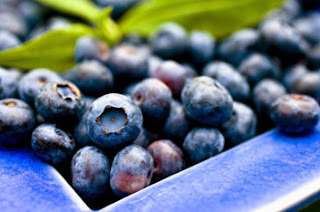 If you can’t find fresh berries during the colder months, stock up on the frozen variety. “Eating frozen berries isn’t as good as eating them fresh, but it’s better than eating them cooked,” says Rade. Run frozen berries under cold water to thaw and eat them in salads, smoothies or yogurt parfaits. Grandma was right to load you up with her own special brew: Researchers are finding that soup works to ward off viruses. One theory is that hot soup raises the temperature in the nose and throat, which creates an unwelcoming environment for viruses that thrive in cool and dry places. Rade points to research that found that the chicken itself has flu-fighting properties. “Homemade chicken soup has protein groups that have been shown to have anti-viral activity,” says Rade. 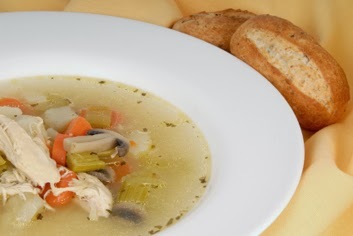 However, he emphasizes that the soup has to be homemade to ward off viruses. “Stuff out of a can isn’t going to have the same therapeutic value,” he adds. Make up a big batch of our Old-Fashioned Chicken Noodle Soup and keep some in the freezer in case of emergencies. entry ni aku search kat fb.dan olah cara aku.boleh diguna bersama. 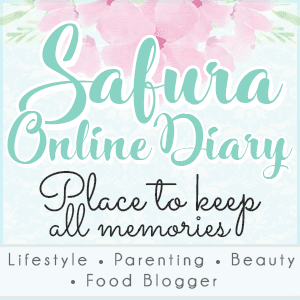 boleh guna tips ni bile mun selsema nanti..